Stair Climber Hire-Stair Walking Man & Machine Service. Stair Climbing - We are specialists in Man & Machine stair climbers Hire offer a stair climbing service. Take away all your health and safety worries, let Specialist Lifting Solutions Lift and Shift Service take the strain with our stair climber hand truck Hire service. Whether it's in the home or in the office, we can move heavy items up to 680 kilos up or down stairs with ease, all our employees are fully trained and experienced to handle all stair climbing hand truck situations. This cast iron radiator weighed 400 Kilos. Hire Specialist Lifting Solutions man and machine service. What is a powered stair climber hand truck? 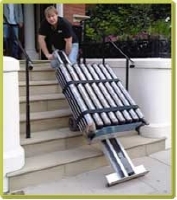 A stair climber can be utilised for relocating heavy items up and down internal and external staircases. The Powermate stair climber we use has the ability to overcome door thresholds, uneven step sizes and navigate around tight turns. Our stair climbers come in various models suited to different purposes and weight limits, the largest of which can lift up to 680 Kilograms. Stair climber hand trucks are used to safely and precisely move heavy items like boilers, safes, gas cylinders, major appliances, office furniture, plumbing & heating supplies, cookers, vending machines, restaurant equipment and much more. To see our NEW animated video example of how the stair climber works please click on the link below. Please take a look at our heavy lifting page where you will find a small selection of heavy items that we are able to move with our stair walkers.